I am using two routers to emulate client 1 and 2. For simplicity you may want to copy and paste the above config into your routers. To achieve the first objective: Client1 should only use ISP2 and if ISP2 is down, client1 should not be able to access the net. ISP2 is using a 56kbps link, so this link is not mission critical. The second objective: client2 when using ssh and https, the traffic will be routed to ISP1. Otherwise ISP2 shall be used instead. Connection refused was because 2651-2 did not set any vty login. But this shows the traffic has reached ISP1. This is because no ip http service has been set on ISP2, but it showed that it reached but because http service was not turned on on ISP2 hence dropped. Showed that there’s 10 packets on the third route-map sequence. Unreachable to ISP1 via port 80, because the route map has filtered away. Because ssh was not turned on for ISP1, but it has reached ISP1. The sequence 20 clause showed that 1 more packet was increased. We have achieved the first 3 objectives of the lab. Let’s look at the last objective. There’s a command that can affect path decision for traffic generated by the router, that is the global configuration command: ip local policy route-map, this command takes care of packet generated by the router itself, the command ip policy route-map is the command that only takes care of incoming packet to the interface. 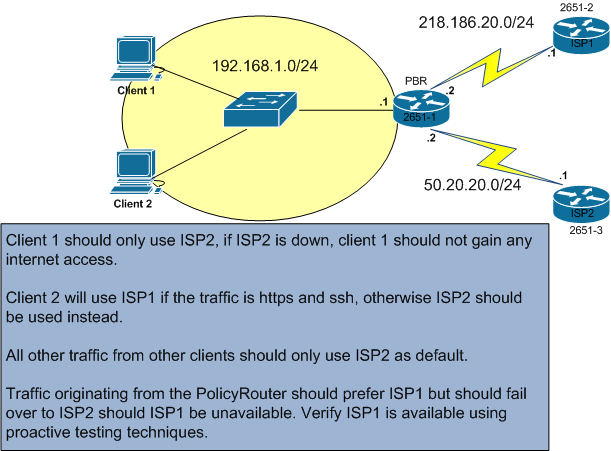 Traffic originating from the PolicyRouter should prefer ISP1 but should fail over to ISP2 should ISP1 be unavailable. Verify ISP1 is available using proactive testing techniques. Traffic originating from policy router which is 2651-1 should use ISP1 first, if ISP1 failed ISP2 will take over. Also verification is needed. For this to work we can use ip sla together with object tracking to check if isp is alive or not. Step1: Set up IP SLA monitor, the command line is a bit different from Catalyst 3550. Then schedule IP sla probe. Step 2: Create a track object, using IP SLA probe to keep track. The key word rtr is actually referring to IP SLA probe. Step3: use the track object created and put into the route-map statement, I have created a different route-map to be used by the policy router only. The number 10 is a sequence number inserted for the next hop address should the 218.186.20.1 is unavailable. Step 4: Apply the route map to the router’s policy using ip local policy route-map command in global configuration mode. Only when ISP1 is unreachable will the path to ISP2 be used. Bring up the serial0/0 interface again. When the link to ISP1 is up, router will only use ISP1 hence the traffic to ISP2 are dropped. This entry was posted in Path Control and tagged policy_based_routing. Bookmark the permalink.